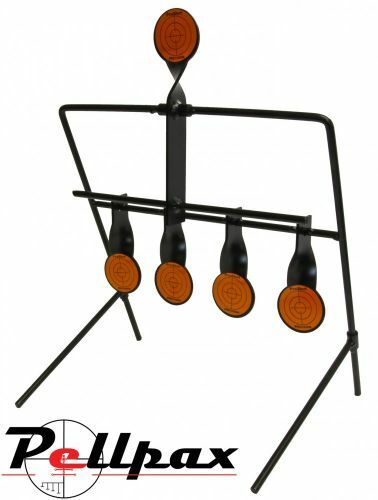 This spinning target from ProShot is made from strong steel to deal with impacts from all sorts of air rifles and air pistols to provide fantastic shooting entertainment. The construction of the target is steel which is powder coated in matte black for a strong and durable finish to last for the years ahead. The two arms fold out to stabilise the target, and it can also be pushed into the ground. The ProShot stickers are bright and easy to see, and can easily be peeled off and replaced when they become tired. The target is simple to use with the lower 4 discs being the initial targets, which once shot rest on the upper top bar which is connected to the top target. Once all four discs have been shot, shoot the top one to reset and start again!